The search behavior associated with businesses trying to find an interactive agency is very different from other models that I’ve looked at in the past. Generally, informational searches dominate search behavior. In this case, informational searches are very small compared to the number of types that businesses specify when looking for an interactive agency. The type category is fairly complex with 13 sub-categories, which is the most I’ve ever seen in single high-level category. It’s interesting that businesses describe the type of agency they are looking for in about a dozen different ways that describe a single need. There are 19 high-level categories of behavior across 7.2 million monthly searches in this search behavior model. The type category is 10 times larger than the next category (social) and I have broken it out into sub-categories later in this article to show in better detail what is going on there. Besides type, there are three categories that suggest opportunities for information architectural focus. 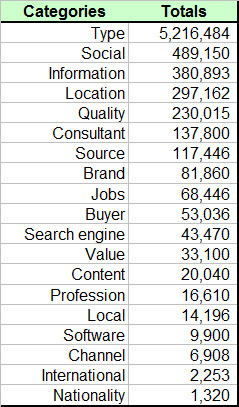 These are the social category, the quality category and the searches by location category. When you factor in the sub-categories, and sort them by volume, you end up with 34 distinct categories of search behavior. You will notice that the type sub-categories are the most varied, and that business people are using a dozen terms or phrases to specify the type of agency they’re looking for. You also notice that these business people are much more interested in quality than they are in value. This list also suggests three conceptual constructs for developing a website message for an interactive agency. These are Social Media, Location and Type – they provide topical focus for a custom landing page and ad copy.